The day started with a hot bowl of oatmeal with walnuts and maple syrup. While eating it the decision was made to fish a small brook today as opposed to the Farmington river. The weather of late has been on the dry side with the only rain coming from thunderstorms so the condition of the stream was unknown. Upon arriving I noticed the stream was in pretty good shape for late August. The flows were decent and the water temp was 64 degrees. The water was clear and visibility was long range. The saving grace was the gray overcast and the tree canopy. I began fishing a Bomber and pretty much stayed with it changing only once to a caddis pattern. It was in this long run along the bank that my first hookup came. 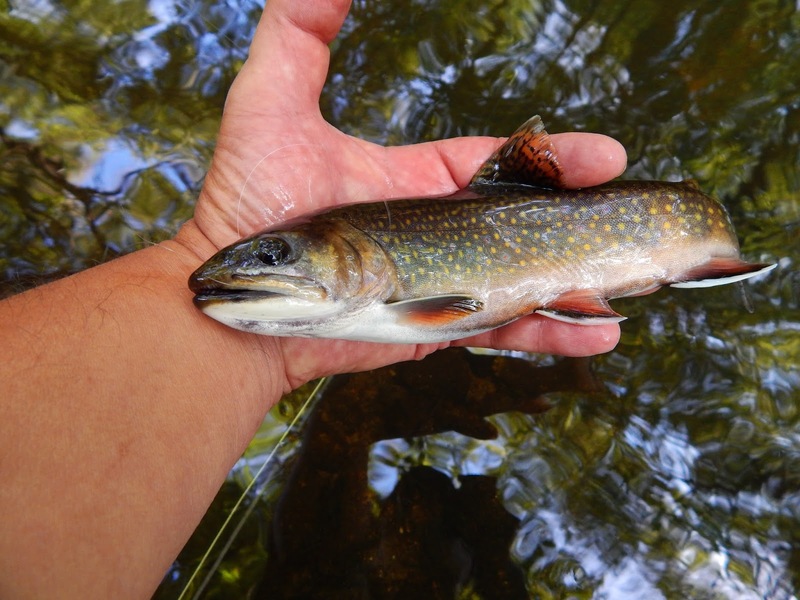 The little brookie was in good shape and a perfect match for the 2wt. A Bomber on the water doing its work. An hour had past since my last response to the dry fly. I was of the mind that this might be a one fish day. On my way back to the car I stopped to fish this deep run. On the way in I fished it and had no reply. On the third drift a fish rose and took the fly. At the very end of the run the stream breaks into some very large boulders, and that's where the fish headed. I was able to convince him to stay out of there and soon he was at hand. 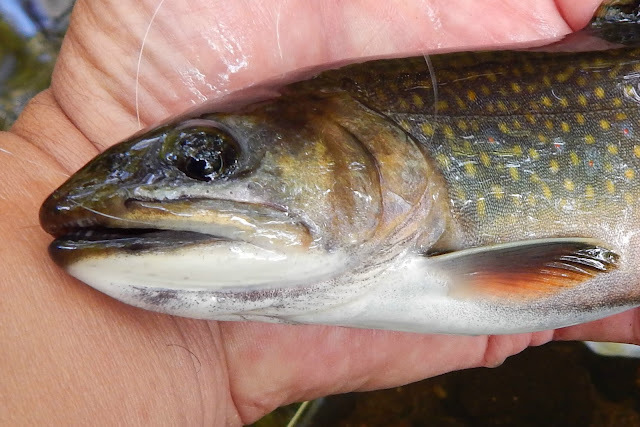 The brook trout was beautiful. Upon release I thought wow I'd like to hookup with this guy come October. Its been a few days now that I haven't posted a fishing report. Yesterday morning I had some hours available so I got up at 4 AM had my Nantucket and hit the road before 5. When I parked at the stream it was still a bit dark but the sounds of the moving water is more stimulating than 5 cups of coffee. As I walked along I tossed out a Bomber and worked the slicks and riffles. The fly did its job bringing several trout to the surface, unfortunately I failed on my part and they never made it to hand. While walking I noticed a few flowers growing along the waters edge. They were like solar lamps. Stopping to take a photo I had thoughts of the book "Trout Flies and Flowers". So looking into the fly box I pulled out a scruffy beat up Edson Tiger. It did not look as beautiful as the flower but it was close as far as color. A well used, well traveled Edson Tiger. It's tied on a small hook. A streamer I primarily use for small streams. I fished the streamer in several runs and had a few strikes. I reached a deep pool and began swinging the Tiger through. I could see that the fly seemed not to be working as I had expected. So what I did was to fish the streamer like a nymph. I cast it up into the pool and let it dead drift. The second cast I could see a fish move to it. Several casts later and the fly was hit. The trout pretty much ran to every hideout he knew in the pool, and then made a run for the fast water above. I was able to gain control, luckily I had the 5wt. Moments later a beautiful wild brook trout lay close to me. I slid my hand under him and admired his beauty. A quick photo and off he went. In his mind was the memory of a yellow nymph. In my mind is the memory of a splendid creation of wild beauty. Jeanette and I paid a visit to a small stream located in the Massachusetts Berkshires. It holds wild brook trout and I have at one time caught a wild brown there, one never knows. The stream was in excellent condition. The flows were much better than I expected. I did not intend to fish today so a fly rod was not in hand. Today was reserved for a walk in the woods and enjoying all that nature puts forth. The weather could not have been better. Wall to wall sunshine a light breeze and temps in the seventies. What a day for a hike. If that stream hold's this way the Autumn fishing should be wonderful. Very first photo. BA Caddis "blackberry"
On my last outing while attempting to photograph a brookie the camera slipped from my hand and hit the water. I snapped it up as fast as I could but it was to late. This is only the second time this has happened to me but it's still costly. I have it sitting in some rice attempting and hoping it will dry and be like it was. A camera to me is almost as important as my fly rod. I can totally enjoy a day on the stream without catching a trout as long as I have a camera. There are so many beautiful things to photograph outdoors and even though you may not think the subject you just took a photo of is no big thing, when put on the computer and looked at for a few moments is quite nice. I purchased a new camera Tuesday evening and have been tinkering around with it trying to figure out how to use it. Technology in cameras changes almost daily and my ability to change with it is a bit slower. I will figure it out. Yesterday was the first time with the new camera and here are a few first photos. We were in far eastern Long Island sound. The area is a coastal reserve. Yesterday was not supposed to be a fishing day, but the chance to do it came up and I took it. The outing was only for a couple of hours and those hours were very early. I was up at 4:30 and out the door at about 5. There was only time for one cup of coffee, and that was not a good thing. I knew I had to stop for one for the road so I did. Back on the road for the 45 minute drive to the stream. Upon arrival at the stream I noticed the water a bit off color. I could not understand this because it had not rained. Oh well, geared up I moved upstream to a favorite pool. The water was almost brown. A bad day was expected. I placed my thermometer in the water and it read 58 degrees, quite cold. I tossed out a wet fly and began to work the pool. On what was my third or forth cast I had a solid strike as the fly rested after its swing. A few casts later came my first hookup which was short lived. I saw several rises along the bank. There were no bugs anywhere. I soon determined that the trout were jumping out of the water for the blackberries that overhang. Dark stream, where the hemlocks grow. The riffles between pools held the trout. Several brook trout were taken in these riffles. A wet fly as well as the BA Caddis worked well. Yesterday three of us teamed up to introduce John,aka Apache Trout aka "Ravine Angler" to the joys of the Farmington. John a resident of Connecticut has never fished the Farmy. Pete and I took John to one of our special sections. We told John what fly to toss, set him in the right spot. On his very first cast a brown rose to fly and missed. It was a wonderful start to a good day. We fished several locations on the river with various degrees of success. Mark joined us later and we continued to fish. While this was a day of not being able to determine what they wanted we still managed a few. One of the highlights of the outing. John while fishing a Hornberg streamer a beautiful rainbow struck. After some coaxing John was able to bring it to hand. "Nice fish buddy". The Hornberg streamer. Tied by John himself. I hope you put that fly in plastic and retire it. Around 6 o'clock the trout started rising. Soon there was a hatch on of something I could not determine. They were tiny and the fish were gorging themselves. I tried many small flies and could not get a single taker. At one point a trout rose literally at my foot. After an hour of that humiliation I moved to faster water. My hookup ratio improved. A brown and two brookies. An assembly of photos that touch on a few interests. Some of them from several years ago and some that are very recent. It's funny how one can look at a seemingly uninteresting photo taken, and you don't know why you took it, brings back your full vivid memory of the place and almost exact time you took it. 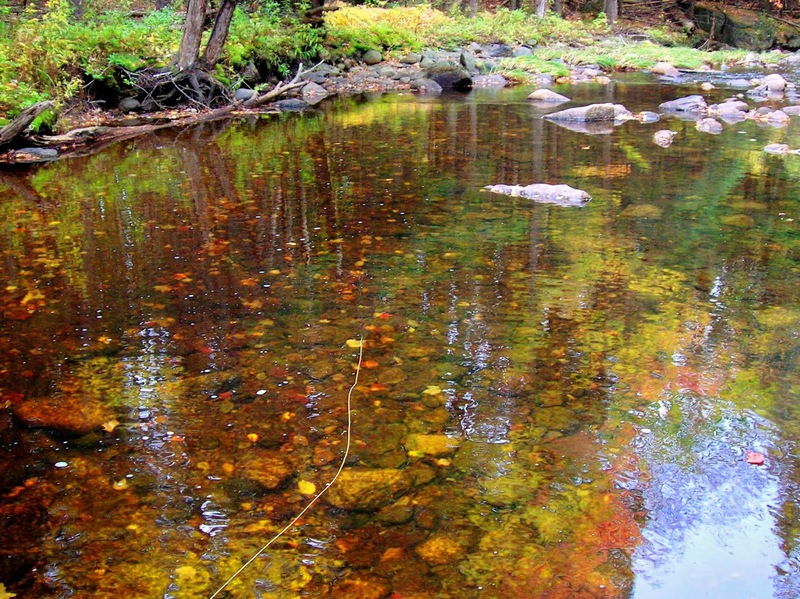 The first photo, called "Autumn Waters" is a quiet pool on a Maine stream. The dry fly awaits the rise of a brook trout. 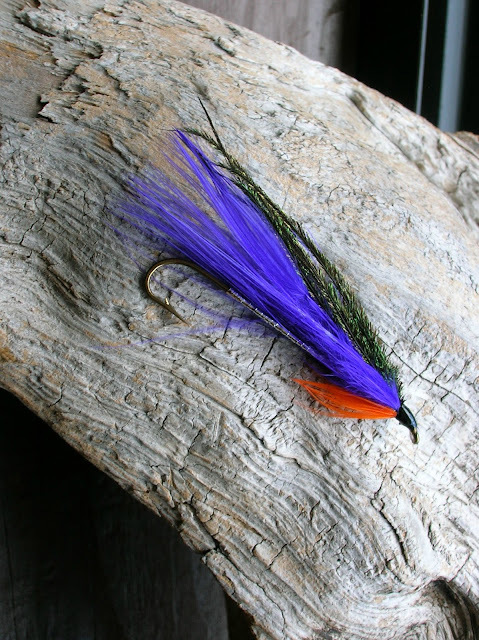 Marabou and peacock are the ingredients of this streamer. You talk about simplicity. Local colors. These potatoes are grown in town. The farm has quite a history, where a generation came back to work a farm that grandparents had done. Have you ever enjoyed fresh potatoes harvested and eaten the same day? Simplicity again, fried in bacon fat, salt and pepper. Sorry Doc. A lighter fare. From the same farm, seasoned arugula and tomatoes on crusty bread. Olive oil, salt and red pepper. Doc's all right with this. This area of the Farmington river is where I first picked up on the fact that brook trout might be reproducing in the wild. This photo was taken in 2010. I'll have more on this in a later post. Do you recognize it? A beautiful animal so well adapted to life in the north. But they are further south than you think.